Explosive brightening of approaching green comet – may be plainly visible in August | Watts Up With That? Image by Michael Jäger on July 2, 2018 @ Weißenkirchen Austria. Click to enlarge. “The gas cloud around the comet’s nucleus is about 4 arc minutes wide,” says Jäger‎. That means the comet’s atmosphere is 260,000 km in diameter, almost twice as wide as the planet Jupiter. These dimensions make it a relatively easy target for backyard telescopes. Comet PanSTARRS is falling toward the sun from the Oort cloud, a vast reservoir of fresh comets in the distant outer solar system. It has never visited the inner planets before, and, as a result, no one can say what will happen when its fragile ices are exposed to solar heat as it approaches the sun in August. Previous estimates of the comet’s brightness max out at magnitude +4–that is, barely visible to the unaided eye from dark-sky sites. Additional outbursts could boost its visibility even more. 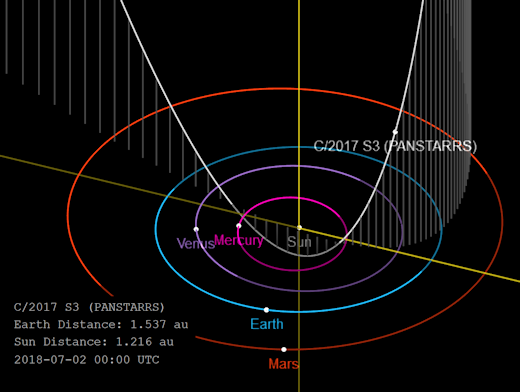 Comet PanSTARRS is approaching the sun on a hyperbolic orbit–a narrow open-ended path that will ultimately fling it back to the outer solar system. At perihelion (closest approach to the sun) on August 15-16, the comet will be inside the orbit of Mercury, blasted by solar radiation at point-blank range. What will happen then? July 4, 2018 in Astronomy. We don’t really now *that* much about the Oort Cloud, but it seems that it is spherical but with a higher concentration of objects roughly around the Ecliptic Plane. The orbital elements, including the inclination, are below. From 116 observations 2017 Aug. 17-2018 May 21, mean residual 0″.4. Thanks jorge but which bit of that jumble answers the questions about inclination? on a hyperbolic orbit–a narrow open-ended path that will ultimately fling it back to the outer solar system. If it’s hyperbolic it’s not an “orbit”. It will not just “fling it back to the outer solar system.” , it will be ejected from the solar system. Sloppy science. could this ejection trajectory be a result of an interaction with the hypothesised planet 9 ? More than likely (99.99999999999+++%) Not. The hypothetical planet 9, to be a planet by the Astronomical Society definition needs to be in the same plane of orbit as the other 8. This would make it virtually impossible to be what dislodged this comet from the Ort. It has a better chance of being dislodged by the much ballyhooed and equally nonexistent Planet X Nibiru. Given the latest definition of planet, is it not the case that it is extremely unlikely that there is a planet 9? The powers at be have almost certainly defined such a possibility out of existence, since it is almost certainly the case that if there is a large body in the outer regions of the solar system, and given the size and length of the orbit, that body could not have cleared debris and small objects from its path. I suspect that if there is a large body (yet to be discovered) no matter its size, it is now likely to fall within the dwarf planet definition/category. and which bit of that jumble answers the questions about inclination? Yes, it will be ejected from the solar system. No, it won’t make it back to the Oort Cloud. We have a new intermittent approaching visitor. I just checked the NASA article and the words “hyperbolic orbit” link to a WonkyPedia page entitled “hyperbolic trajectory”. What has happened to NASA, they can not even get the science right when copying from WP ?! Surely approximations like “elliptical”, “hyperbolic” and distinguishing between an “orbit” and a “trajectory” are not that useful when dealing with such loosely-bound objects in a more-than-two-body system over long timescales. While the trajectory of the comet over the coming months might usefully be *approximated* by an ellipse, parabola, or hyperbola, taken over a much longer period it will be a much more complicated shape with elements of chaos. It might return; it might escape; it might lurk. Yes, there’s not much difference from where we stand. The number in boldface, 99.03829, following the word “Incl.” is the inclination. Note that the eccentricity, e, is estimated at slightly greater than one, so the orbit is hyperbolic. From our minuscule viewpoint, there isn’t that much difference between a huge ellipse, a hyperbola, or a parabola. One thing is certain: you won’t see this comet come back again. If you want the inclination, go to the JPL web site linked to the orbital illustration. You can zoom in, zoom out, and shake it all about. To answer your question directly, it’s about 75-80 degrees to the plane of the ecliptic. I’m just staggered, and very grateful, that planet earth isn’t assaulted by large space rocks regularly. I know we’re a small target, but there’s an awful lot of debris out there looking for a place to land. Part of the definition of a planet is that it clears it’s orbit. ie it either absorbs or ejects all other bodies in the zone of its orbit. That all happened a long time ago. Our orbit still has 1080 mile diameter ball in it. Are we no longer a planet? I wonder just how visible it will be. Previous predictions for comets have been rather off (remember Kohotek?). Kohotek was a disappointment, but I have fond memories of seeing a Hyakutake surprise. I saw Kohoutek with ordinary 10×50 binoculars. I was a young kid at the time age 10. It was VERY low to the horizon. But you are right, it was nothing like the predictions. Is that a typo? should it be … went from +9 to +12…and that made it brighter?? I’m guessing that this is a logarithmic scale but how does a factor or 16 make a difference of 3? Is it totally arbitrary scaling? 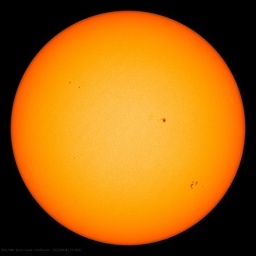 Each magnitude means a factor of 2.5 in brightness, so an increase of 3 magnitudes is 2,5^3 = about 15 times brighter. But magnitude 6 is just barely visible to the naked eye, so it’s still about 15 times too weak to be seen without a telescope. The definition is 5 magnitudes is a factor of 10. See my other comment on the topic. It’s Green, so uses Michael Mann Math. That’s one of the goofy things about astronomy. I think someone started a list with bright stars at the top and dimmer ones below, then wrote numbers from 1 to bigger on the way down. A difference of 5 magnitudes was assigned a factor of 100. Will be a pretty hot view from Mercury. Something to look forward to in the cold of August in Australia. Almost as exciting as Nigel Farage visiting in September and possibly Donald Trump visiting in November. Dare say the predictions of the exact viewing schedule for the comet will become more clear over the next few weeks as well as more accurate, unlike climate “science” which not only becomes more opaque with time, but also less accurate. Comets are named after their discoverer. When automated tools and orbiting observatories joined the fray, comets still get named after the discoverers. Perhaps you can start your own catalog and sell that. “Green Lantern” marketed by DC Comics? The Weather Channel is on it no doubt. If they can name a cold front, they can name an Oort Cloud body in the inner solar system. Yes, but they must have gender neutral names with lots of “diversity”. Are we sure this is a comet? I recall that last year we were warned that the planet Nabiru(?) was on a collision course with earth; it apparently does this every 3,600 years. The reason we couldn’t see it at the time was because it was sneaking up on us from behind the sun. And notice how it very sneakily increased its brightness? Has it now thrown off its disguise, and is bearing down to have its wicked way with us? Remember the green colour. It does appear that green policy is what is likely to destroy our energy based civilization. Perhaps the Nabiru legend is a metaphor for the destruction of humanity by the green monster. They started the braking rockets. Like the mote in god’s eye. Question: Wouldn’t a hyperbolic orbit ultimately cause the comet to leave the Solar System all together? Indeed and it’s not an “orbit” , it is a trajectory as I just commented above. More sloppy science and half-assed press releases. Yes, it is an orbit. You have circular orbits, elliptical orbits, parabolic orbits, and hyperbolic orbits. Unfortunately, many authors use the word “orbit” with the meaning “revolution”. The orbit is a path, while revolution means motion along that path. For instance, some authors write that the planet Mercury makes 4 orbits per years. But Mercury has only ONE orbit, its orbit, which is an ellipse with an eccentricity of 0.206. In one year, the planet performs 4 revolutions on this orbit. Velocity also plays a part. The comet is not moving fast enough to be falling in from interstellar space, so the theory is it was perturbed from the outer Oort Cloud. It’s velocity will carry it back out (to a different region) but not beyond. I thought parabolic and hyperbolic orbits were by their nature “one and done”. When it heads back out, it ain’t stopping. But as it moves back out of the Sun’s gravity well, it loses velocity (exchanging it for potential energy). When it gets back to the distance it fell in from, its outward velocity will drop to zero. There being a lot (in theory) of other object out there, we can’t predict its trajectory past that point. Parabolic and hyperbolic “orbits” aren’t closed, but if an object doesn’t have solar escape velocity, it’s not getting outside of the Sun’s Hill Sphere. When the article treats a hypothetical entity such as the Oort Cloud as a Fact, its safe to assume that all other conjecture will be dealt with similarly. I do love good science fiction, too bad references to global warming couldn’t have found their way into the narrative. Comets are not four-and-half billion-year-old icy leftovers of the early solar system. Prepare for a coronal mass ejection . Instead of a hint, why not say that the comet is electrically linked to the sun and that linkage caused the brightening? I hope another comet like Hale-Bopp comes through sometime. My daughter likes astronomy and I know she would go outside every night to check out something like that. I was living in the middle of Atlanta at the time and it was ridiculously visible, even with all the buildings and lights around. What happened to the Heaven’s Gate folks was sad, but the view of that comet was simply unforgettable. Pity, it was a great comet. Possibly the best of your entire life. After much fanfare, the return of Halley was a complete disappointment. On the other hand, Hale-Bopp not only met expectations but easily exceeded them. It was an eerie spectacle–very hard to explain. Now THIS is science I grok! Hopefully northeast wont be clouded over on those nights. Oh, snap, I be done jinxed it! Any ideas what is causing the green coloration? Seems a bit odd. It is an ablating shield to brake its entry into our system before it ejects its army of invading organisms down to Earth. I guess. Hope they got the proper permits for use in our system, EPA will be on their a$$ otherwise. Under the effect of solar radiation this artificial object is becoming active, that’s why it suddenly increased its brightness. This was all described by Arthur C. Clarke in Rendezvous with Rama. It is using the Sun’s gravity to increase its speed and steer its trajectory. We should remain very quiet in case it is reporting system activity back home. We should immediately cease every type of radiation that leaves the planet or risk undesired attention from potentially dangerous ETs. The precautionary principle demands it. Quickly, shut down everything! They are listening! right, better safe than sorry, shut it all down. If we don’t shut it all down by … Friday at 3:00 am (NY time) … we will reach the tipping point of alien invasion. Think of all the future generations (not just your grandchildren) of slaves to the alien overlords. It will be a small precautionary price to pay … shut it down for a few months. Hyperbolic does not always remain hyperbolic when tugged by planets. Do your own thinking. SOME Comets DO come from outside the solar system. It’s \green so hyberbole is expected. Oumuamua has an eccentricity 1.196, surprisingly low perhaps, but I’d need to think about it some to determine its speed outside the solar system. The semi-major axis plays a big role too. Perhaps Jean Meeus already has. Voyager 1 is escaping the solar system at a speed of about 3.6 AU per year. Voyager 2 is escaping the solar system at a speed of about 3.3 AU per year. Those eccentricities seem awfully high to me. I definitely need to review conic section theory.